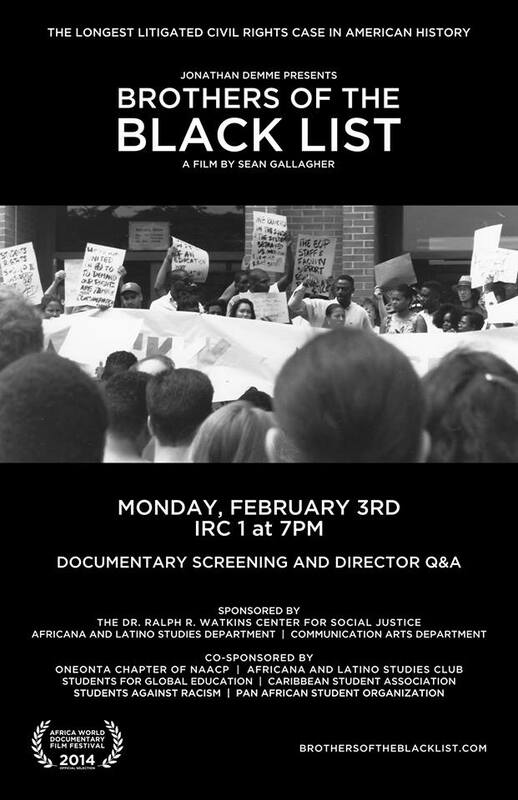 On Monday, February 3, IRC 1 was the place to be. The room was packed and the vibrant energy was tangible as everyone sat in anticipation of the film “Brothers of the Black List.” The documentary, directed by Oneonta alum Sean Gallagher, highlights the poignant civil rights case, Brown v. City of Oneonta, which occurred here in 1992. People scrounged to find a viewing spot—anywhere from sitting on the floor to standing at the very back row—because this was an event that no one could miss. I was lucky enough to get a seat in the front row where I could see every part of this amazing film. One interviewee in particular, Edward “Bo” Whaley, who was an EOP counselor during the time of the Black List incident, was instrumental in helping the viewer really understand the depth and pain of the situation. Whaley was a friend to every student. He was the one students could call if they got into trouble. There was a strong bond between Whaley and the students that was evident as he thought back 22 years, and began to get emotional because he could not handle the intensity of his memories. Many times throughout the duration of the film, Whaley was shown cursing and growing angry–you could tell that the whole ordeal really hurt him. By the end of the documentary, we saw Whaley finally breakdown and cry, and I joined him. Following the film, there was a question and answer session with Sean Gallagher. A member of the audience asked the director what had prompted him to create this documentary. I also wondered this because Sean is white, so one could assume that the case did not directly affect him. He answered this by first explaining how he came to obtain the information for this project. On the day before he graduated, Sean got a call from Kathleen O’Mara, professor of Africana and Latino Studies here at SUNY Oneonta. She told him that if he ever wanted to tell the real story of what happened, she would provide him with the information necessary to do so. Sean said that he felt he had an obligation to tell the story of the victims of the Black List. 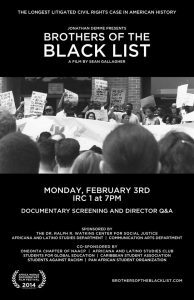 He also said that he wanted to bring his film to various college campuses in order to start a much-needed conversation on racism in America. Someone else asked if Sean had considered making another film on more recent acts of racial discrimination that have taken place in Oneonta. He said that he had interviewed many people on that topic and he had some very good footage, but he just couldn’t fit it into his film. Despite the scenes that did not make the cut, the film was phenomenal. The events that were recounted by the subjects of the documentary were heart-wrenching and real. I am so glad that Sean chose our school to be the first to view his film. It was truly an incredible experience and the Black List is something that should always be reflected on and never forgotten.